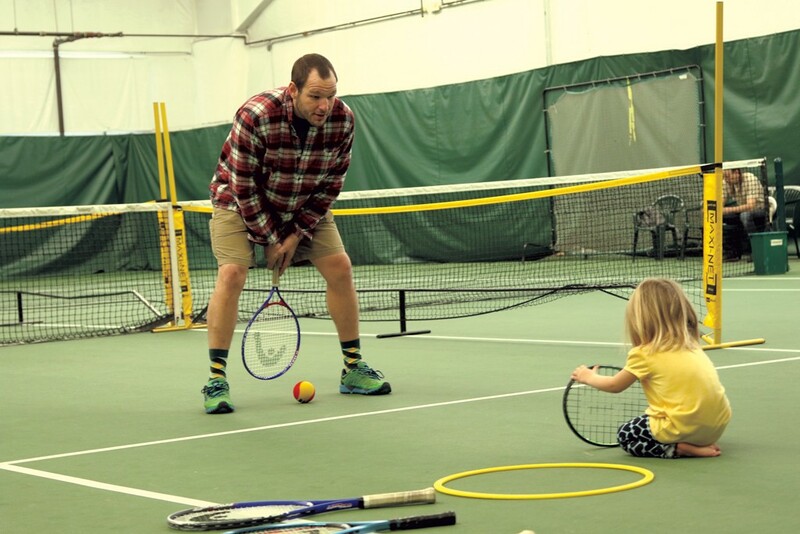 Family Play Day at Middlebury Indoor Tennis Hits All the Marks | Destination Recreation | Kids VT - small people, big ideas! I'm always looking for inexpensive ways to help my 2-year-old daughter burn energy during the colder months. Family Play Day at Middlebury Indoor Tennis hit all the marks: free, fun, supportive and family-oriented. The indoor tennis facility, which operates as a membership-based tennis club, opens its doors to families on Sundays for free tennis. The facility was opened in 2001 by local couple David and Eleanor Ignat, who donated it to the Addison Community Athletics Foundation in 2014 so that it could be run as a nonprofit organization. I checked it out with my partner, Tristan, and our daughter, Elise, on a snowy Sunday morning. We passed through a door and a layer of floor-to-ceiling safety nets to get to the three courts. Several older kids were hitting balls with their parents on one court. Another was divided into three smaller sections. In one area, we found an array of kid-friendly equipment — children's tennis racquets, foam balls and a small obstacle course with cones, rings and low hurdles. The loud noises and commotion made Elise feel shy at first, but it didn't take long before we were tossing balls, hopping around the obstacle course and swinging racquets. At the court that day, we met Erin Morrison, program coordinator for the ACAF, playing with her own toddler daughter and husband. Morrison runs the weekly event with help from a local high-school tennis player. She explained that ACAF aims to get more families involved in tennis by removing barriers to playing the sport, like the cost of joining a membership facility. The foundation also provides a relaxed environment for beginners, with smaller courts and special tennis balls with 75 percent less bounce than regular ones. In addition to Family Play Day, ACAF brings tennis to schools throughout Addison County. After a three-week school program, Middlebury Indoor Tennis hosts a special night for students and their families to play tennis and eat pizza together. When the Sunday event started in the late fall of 2015, parents would often drop off their kids on the court and then wait in the lobby, Morrison said. But she and her staff would encourage the parents to play, too. 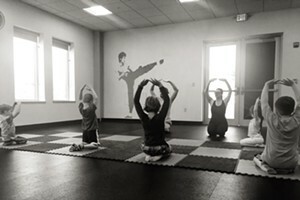 "It's another way for families to be active together," she said. She points out that tennis can be played year-round, and it's a great way to cross-train for other sports. "If you can get your family engaged early on and loving the sport, you can play together for life," she said. Family Play Day at Middlebury Indoor Tennis takes place every Sunday from 10:30 a.m. to noon during the school year. Free Youth Match Play, where kids participate in round-robin play, is held once a month. Residents of any town are welcome. Staff is available to help, but formal instruction is not provided. For more information, visit middleburytennis.com.